I have no idea where July went or, indeed August. Somehow it is a good few days into September and I'm wearing jumpers. It's still not entirely cold enough for jumpers, and truthfully, I am a little bit too warm right now, but it's the annoying sort of temperature when it's a bit too cold for just a top. So I'm embracing the snuggly look and temperature. My book for September is going to be Paper Towns by John Green. 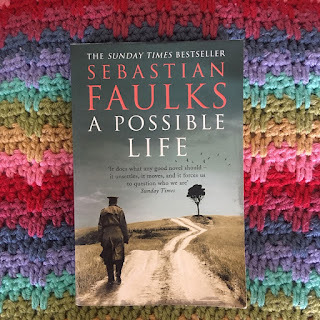 I enjoyed The Fault in Our Stars when I read it a while ago, and I found this book in mine and Ben's favourite charity shop warehouse where the books are three for £1. My book for July was Paradise by A.L. Kennedy. This was an impulse selection from the library and I enjoyed it quite a lot. Hannah is an alcoholic, and it's possibly the first book I've read which features a female alcoholic as the main character. Hannah meets Robert, also an alcoholic, and the book follows them and their relationship with each other, as well as their relationship(s) with alcohol. Definitely worth a read. When I've been travelling in the past, I've tended to read a Harlan Coben thriller. They are usually easy to read and fast-paced, and that's what I often want from a book when I'm abroad. My trip to Iceland was no exception and I had downloaded Don't Let Go* from NetGalley. That pretty much sums up the book - easy to read, moved at a good pace, not terribly surprising or likely, but kept my attention on a flight. Another book chosen for Iceland was Luna Rising by Selene Castrovilla*. Luna's broken up with her not-so-secretly gay husband and is trying to find love again. Luna also had a voice in her head which I found a little disjointed from the rest of the book, and I found her as a character quite annoying. I read this on the plane to Iceland and it occupied me for a few hours. On the plane back from Iceland I read Juniper Lemon's Happiness Index by Julie Israel*. I find that NetGalley is a bit hit and miss sometimes - but I had a feeling that I would thoroughly enjoy Eleanor Oliphant is Completely Fine by Gail Honeyman* and I was completely right. It was excellent. Despite the title (or, perhaps, because of the title) you know that Eleanor is absolutely definitely not fine. I can't really say much about this book without giving away what happens, but as the book unfolds you learn about Eleanor, her Mummy, and you start to piece together what happened in her childhood. I read the ends of books when I'm about a third of the way through them (this appalls my mother, and many of my friends, but I've done it since I could read, and I'm not going to change now) so I knew what happened to her, but it was still incredibly written in terms of how all the bits of the plot came together. I'm currently recommending it to everyone, and it's annoying this is a debut novel as I can't immediately go and find other books by her! Fingers crossed she writes some more, and soon! *Received from the publishers via NetGalley. All thoughts and opinions are, of course, my own. I finished reading Eleanor Oliphant this morning, I couldn't put it down! Such a good book! Yes! I'm still recommending it to everyone, and so far people who have followed my recommendation have liked it...which is reassuring!